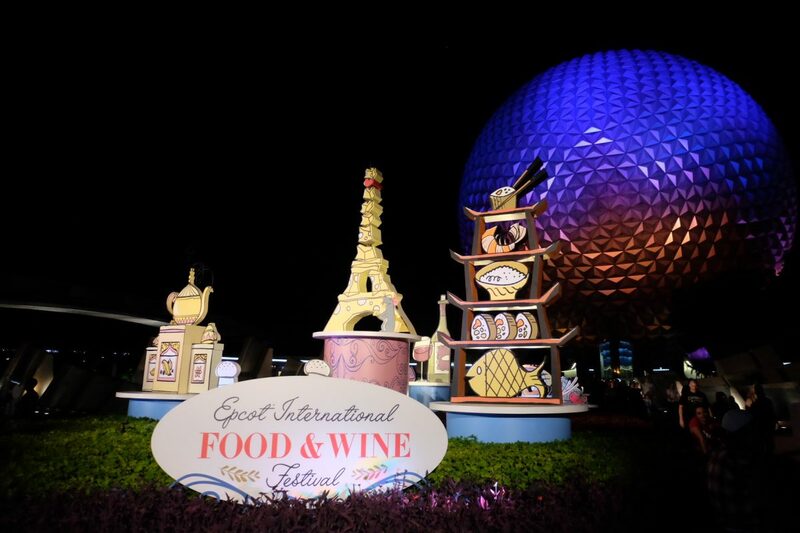 The International Food and Wine Festival is in full swing at Epcot and we couldn’t wait to start eating our way around the world. If you guys know us, we love to eat and we love trying new things! 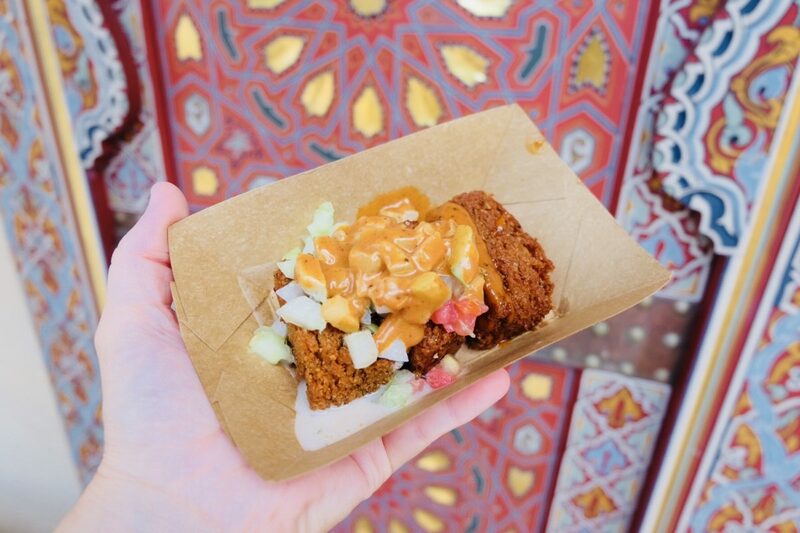 We did our best to try a variety of foods around the world-in the name of research, of course- and here are the ones we found to be some of our favorites from this year’s festival. If you follow us on Instagram, you’ll know we tried A LOT of foods to come up with list so we hope you find this helpful! 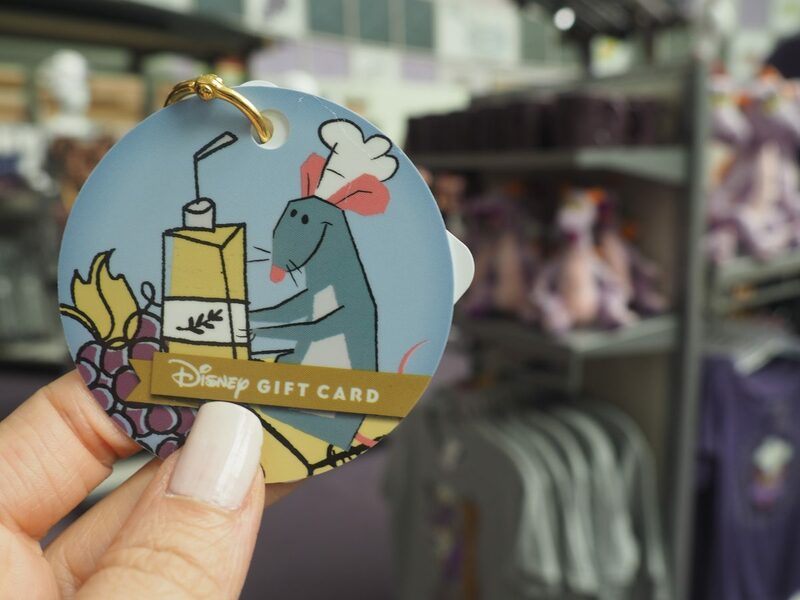 If you’re new to the Food and Wine Festival at Walt Disney World never fear! 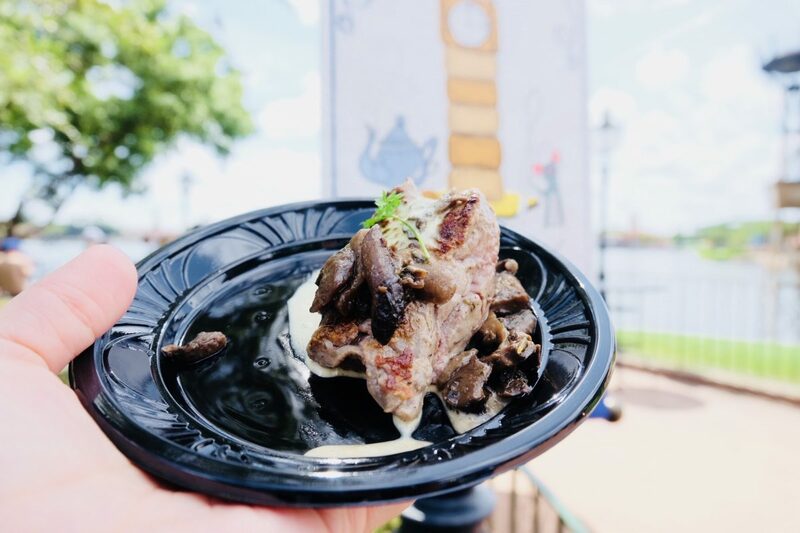 Check out our Disney Food and Wine Festival Beginners Guide, for tips, tricks and a strategy around the World Showcase! Travelling with little ones? Check out our best tips if you’re traveling to Food and Wine with kids. As with every festival at Epcot, this year’s Food and Wine festival included both new dishes and old favorites. We noticed some of our favorites returning from last year and couldn’t be happier. 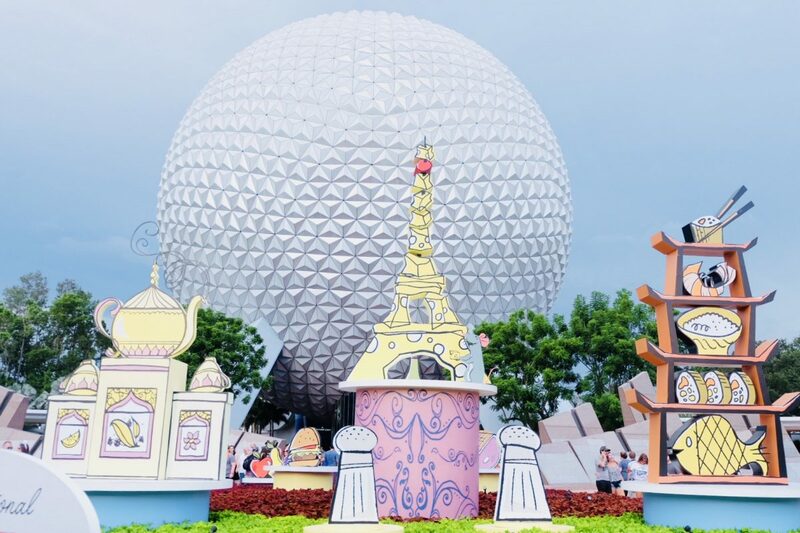 But even some of the more familiar dishes we knew from previous festivals at Epcot, we noticed had gotten a refresh, either in presentation or flavor; so if you didn’t like something last year, it doesn’t mean you won’t like it this year. Hopefully you can find a few new favorites from our list! With a lot of buzz surrounding this new booth, we knew we had to try it! The biggest complaint we’ve heard on this one so far is that it’s light on the champagne, and we have to agree. 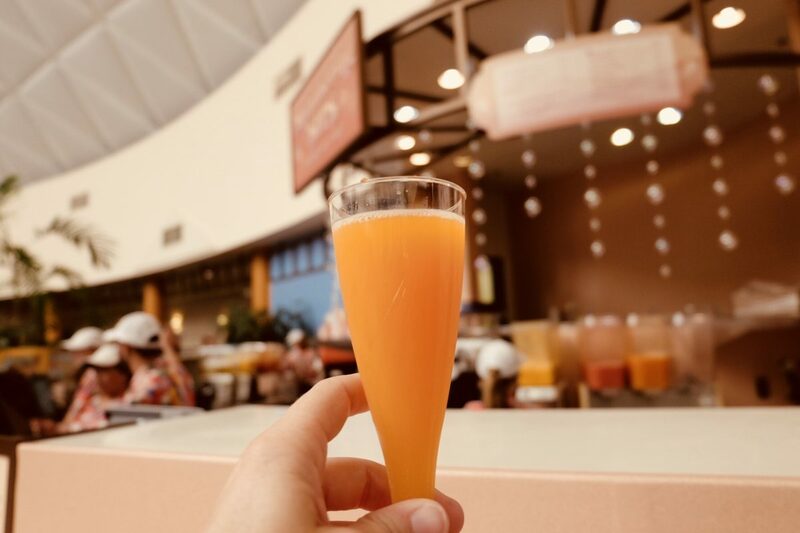 But if you like mimosas, you can find some fun flavors here and even a non-alcoholic drink if you’re not a drinker or are traveling the world with little ones. We really liked the Tropical Mimosa and the Madras! 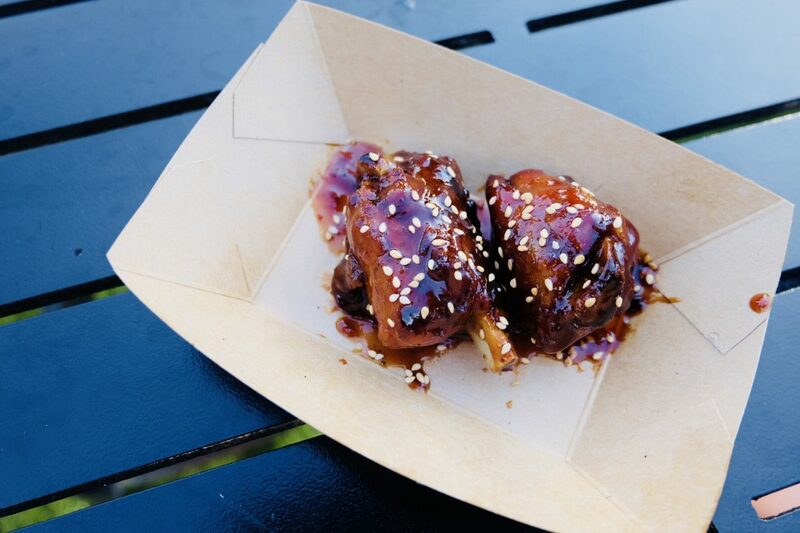 These Korean BBQ pork wings were nothing short of phenomenal. The meat was tender, the flavors were perfectly blended and they tasted like they had been smoked for hours. If you’re a fan of smokehouse type food, these are a must try for your visit to the Food and Wine Festival. 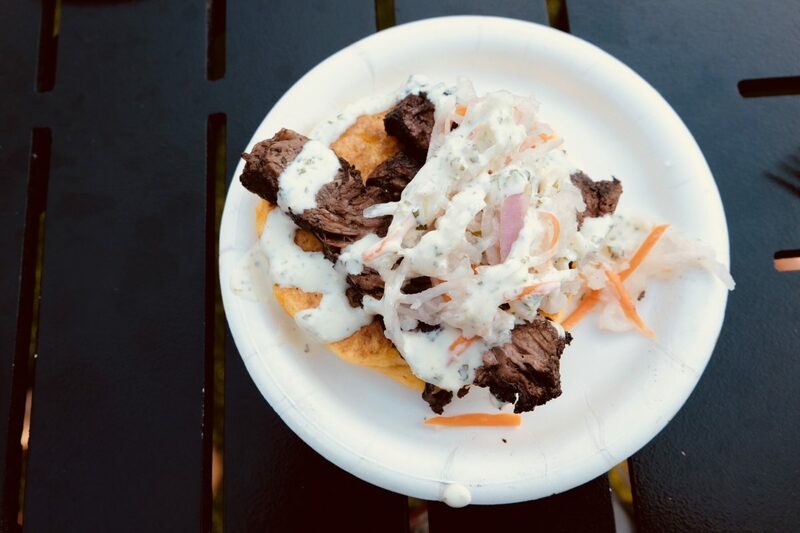 Another favorite from this booth, this skirt steak was perfectly cooked and the corncake and cilantro aioli were the perfect additions to this dish. Honestly this was one we could eat an entire meal out of! Ok, ok, we know…. another one from this booth? What can we say, the CM working told us they had the best food in the whole festival and he wasn’t wrong! If you like dark chocolate with a bit of a kick, this might just be your new favorite dessert. This was available last year, but we noticed it got a refresh and we loved every bite. With flavors that reminded us a bit of Mexican Chocolate, this decadent dessert was not too sweet with a bit of spice to amp it up a bit. Complete with potato chips, this burger is what dreams are made of. 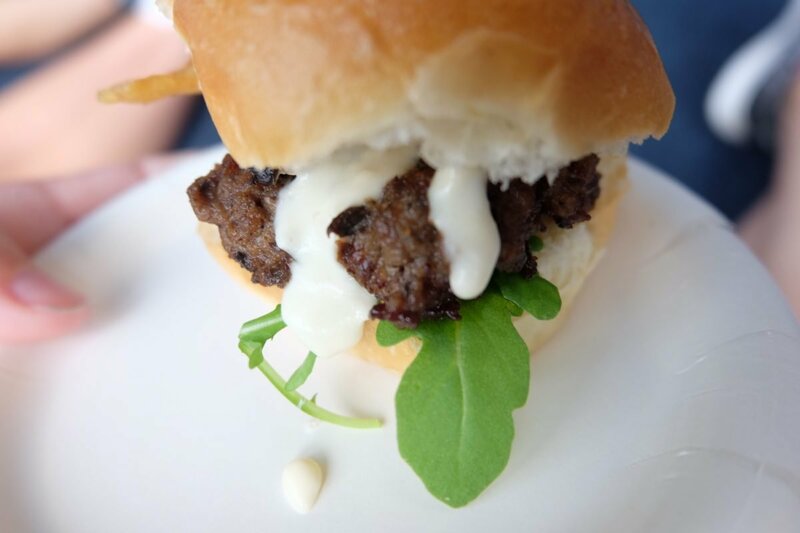 Perfectly seasoned and cooked, this burger was small but mighty and is the perfect slider for any carnivore out there! This makes our list every year and we aren’t even mad about it. 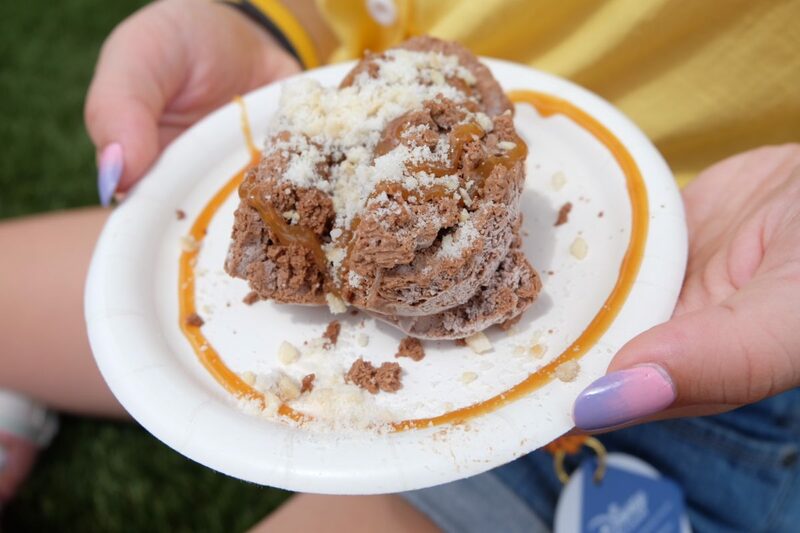 One of our favorite desserts from all of the Food and Wine Festival, the liquid nitro truffle is a chocolate mousse frozen by liquid nitrogen, making it a perfectly smooth concoction almost like ice cream. 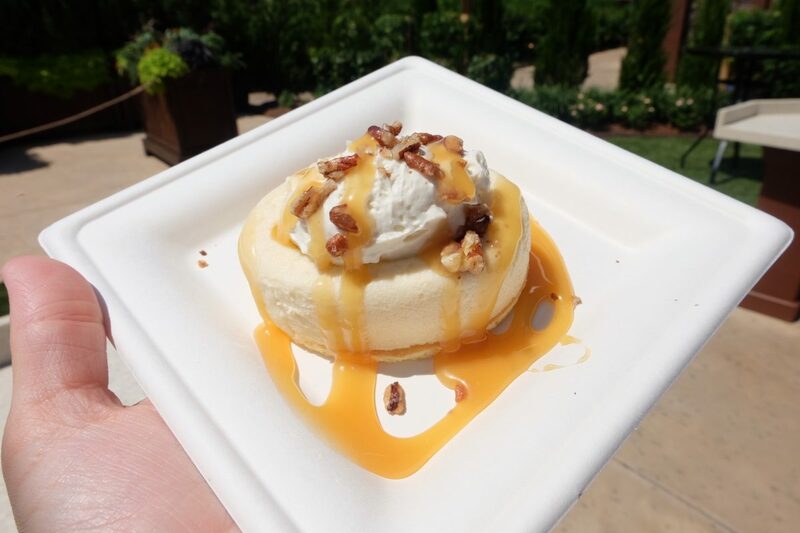 Topped with a whiskey caramel, it’s the perfect treat for a hot day at Epcot. And if you’re lucky enough to see it being made in the nitrogen, the process is pretty cool too! 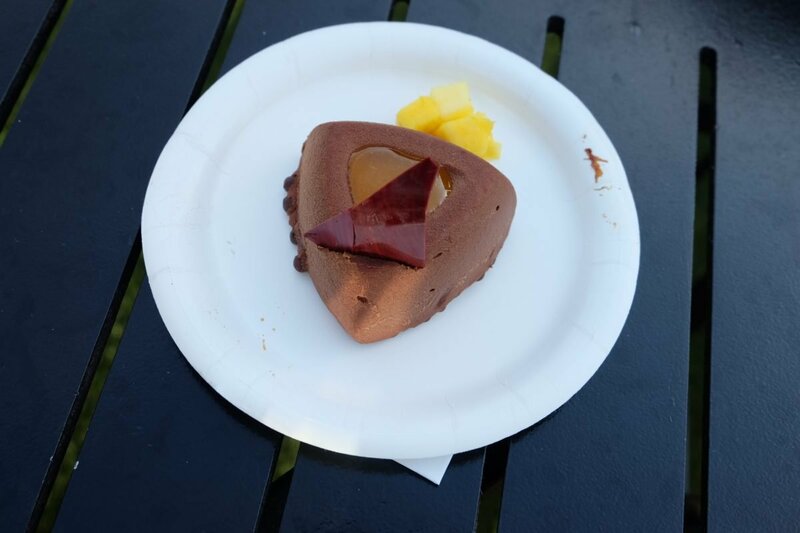 One of the vegetarian options available at the Food and Wine Festival, this cheesecake was super creamy and rich. We recommend saving it for later in the day though, as it will melt super fast in the hot Florida sun. Topped with caramel and pecan crunch, this cheesecake was the perfect balance of flavor and texture. 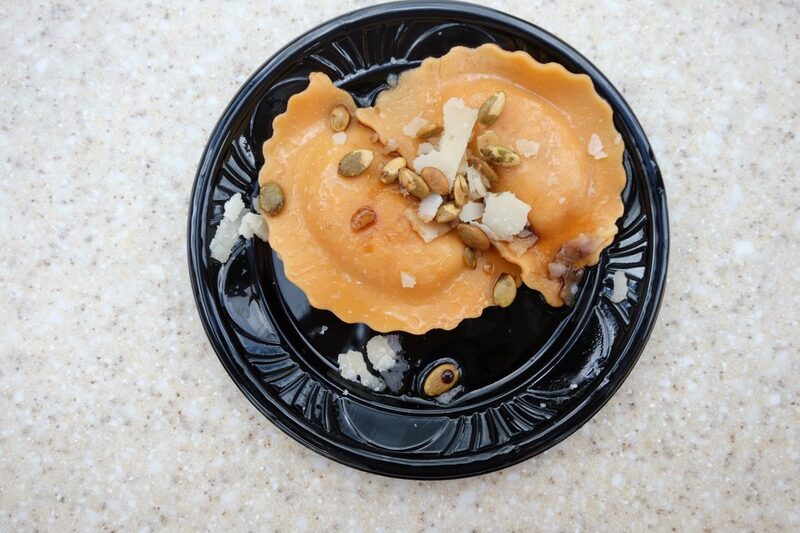 Another vegetarian favorite from the Food and Wine Festival, this ravioli was the perfect taste of fall. Topped with pumpkin seeds, parmesan and a brown butter vinaigrette, this reminded us of all of the comfort foods we love at home for this season. If you have a dairy sensitivity, we recommend you check out The Almond Orchard. We actually have tried everything at this booth and it’s all good. We particularly liked this spinach and artichoke dip with its bold flavors and who doesn’t love a good dip?! FYI- this dish does have parmesan cheese in it, so if you are truly dairy sensitive, be sure to ask at the booth which items they recommend before comitting to something you can’t eat. Topped with a tomato aioli, this empanada had a flaky crust and a delicious, slightly spicy filling of Ropa Vieja. 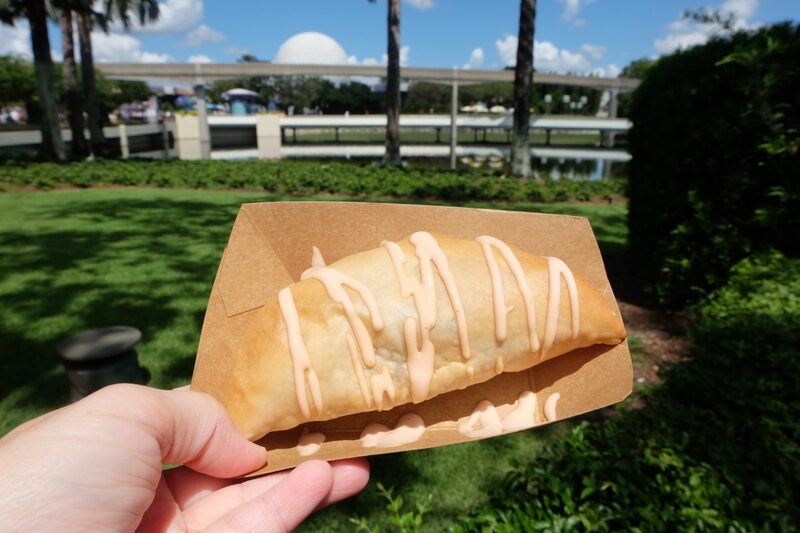 We make this at home(minus the empanada) and are happy to report that the Food and Wine Festival version is pretty darn good. If you love bolder flavors like we do, this should top your list. Probably one of our favorite dishes from the Food and Wine Festival and vegetarian to boot, we could’ve eaten these all day. With delicious greek flavors, this vegetarian dish is one we don’t recommend skipping. Even if you’re not a vegetarian, these nachos are a crowd favorite and for good reason! Found in the American Adventure, this new slider was actually much better than we thought it would be. We often worry about the bun getting soggy or the meat not being tender enough with this kind of dish, but we were pleasantly surprised that this wasn’t the case here. 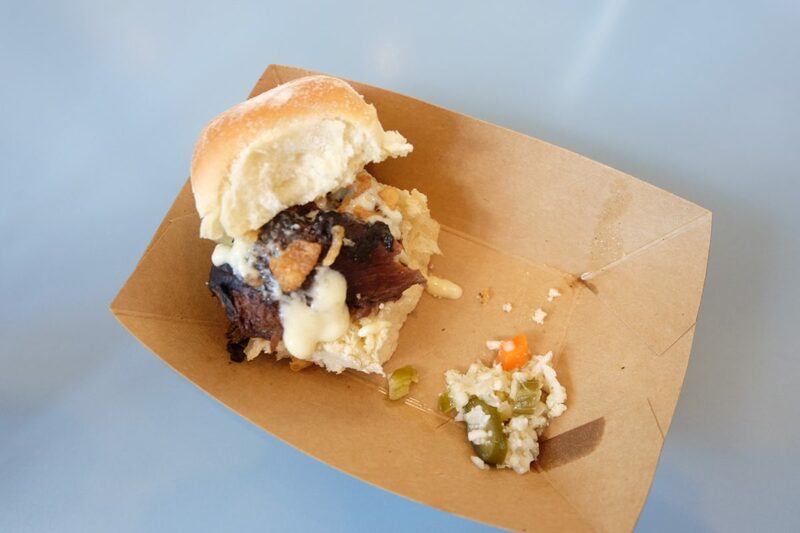 The flavors were a perfect blend, the brisket was plastic fork tender and the entire slider just came together so nicely that we would have liked to see this in a full size sanwich. With chicken, vegetables and sweet teriyaki, this little bun will please even the pickiest of palates. 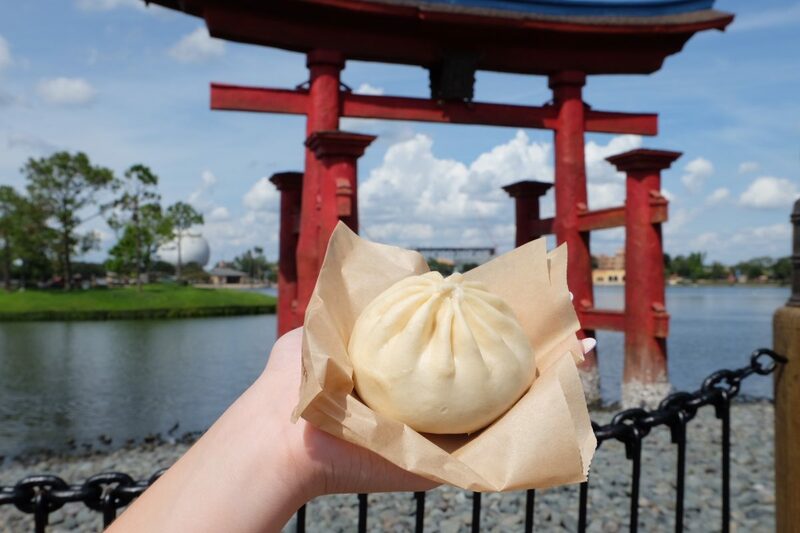 (Unless of course, you don’t like teriyaki) Wrapped in a steam filled bun, the filling was delicious, it was easy to eat and super portable too, so you don’t have to stop your around the world showcase travels if you don’t want to. These made our list last year too and in our opinion, they’ve only gotten better. 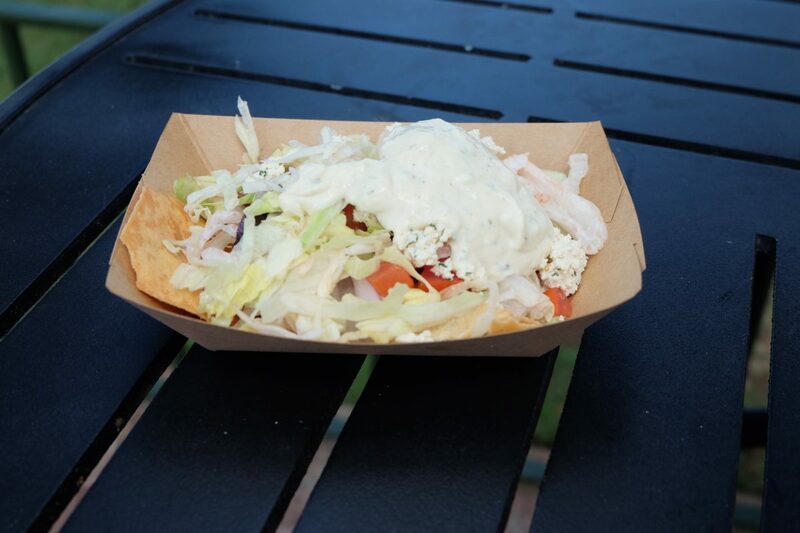 Another vegetarian option at the Food and Wine Festival, these are topped with cucumber, tomato, onions Tzatziki sauce. A bit spicier than last year, if you don’t like spicy foods or can’t have them, this may be one item you’ll want to skip. We love all things spicy, so for us, this was a must have. We know everyone raves about the Cheddar Cheese soup from Canada, but we find it a bit overrated. The filet, though? Perfection! I don’t even like mushrooms and I highly enjoyed this. 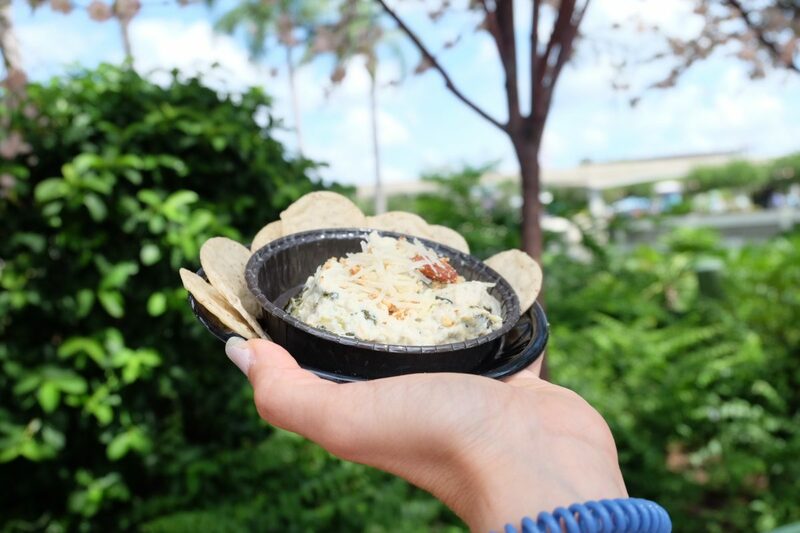 Perfectly tender and perfectly seasoned, AND at $8 can be used as a snack credit, we think this is one of the best things you can get at the Food and Wine Festival. Sorry Cheddar Cheese Soup. But not that sorry. 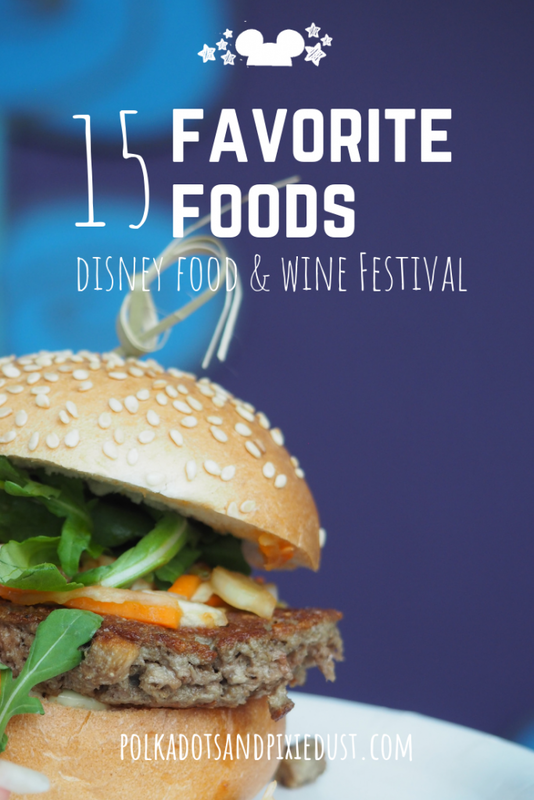 So there you have it, our favorites from Epcot’s International Food and Wine Festival! One thing we always want to remind you is that there can be inconsistencies from cast member to cast member, so sometimes even the presentation you see in our photos may differ from what you get. We actually found at times, dishes changed from day to day!